Fishy Filaments watchers will know that we work with Materials Libraries. These are companies that drive product innovation by making new materials available to professional designers. 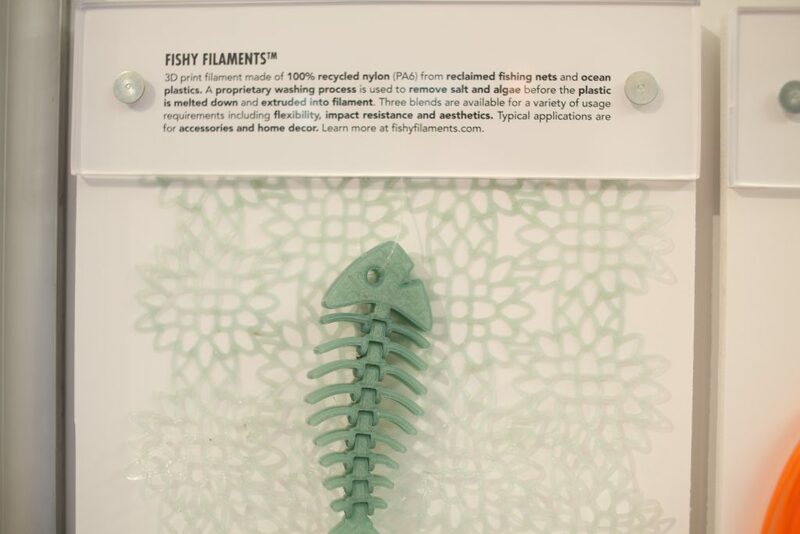 In this guest post we invite Lauren Birritella, Senior Curator for Glen Raven Inc to explain their latest global exhibition and how Fishy Filaments 100% recycled nylon fits in. Lauren, tell us all about it. Its on display at the Glen Raven headquarters in Burlington, NC for the month of April 2019 and then travels to our Concept Galleries in Anderson, SC, Miami, FL, Lille, France and Suzhou, China. Each location features the exhibit in the local language (English, Spanish, French and Chinese) and is on display for one month. Why is there a focus on additive manufacturing? As a global manufacturer of innovative fabric-based, market-driven solutions Glen Raven is interested in how additive manufacturing will revolutionize the future of manufacturing. Areas of specific impact include: freedom of design, mass customization, rapid prototyping, reduced transport costs, reduced lead times and elimination of material waste. More widely areas of interest include advancements in filament materials, localized production of machine parts and more. 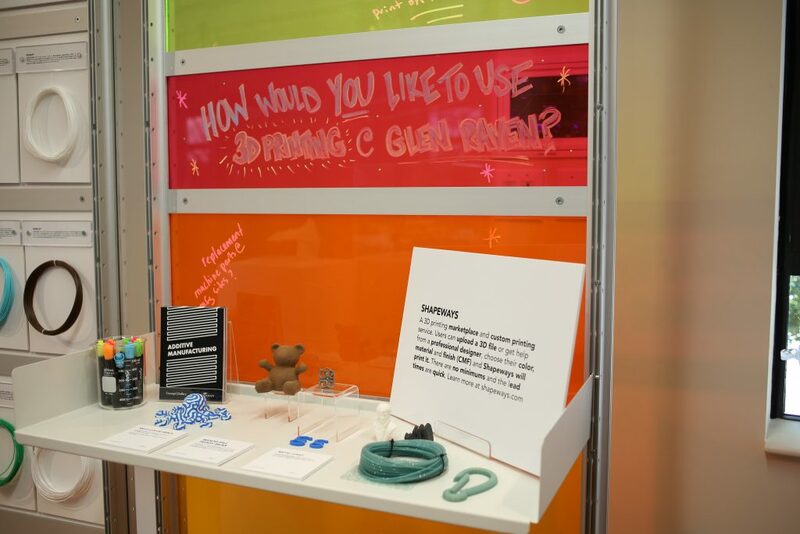 This exhibit explores 3D printing from innovations in everyday consumer products to large-scale commercial projects that include electric vehicles and an autonomous construction site. So Fishy Filaments hits most of those targets and its great to get our product in the shop window but how does Glen Raven actually work with designers ? 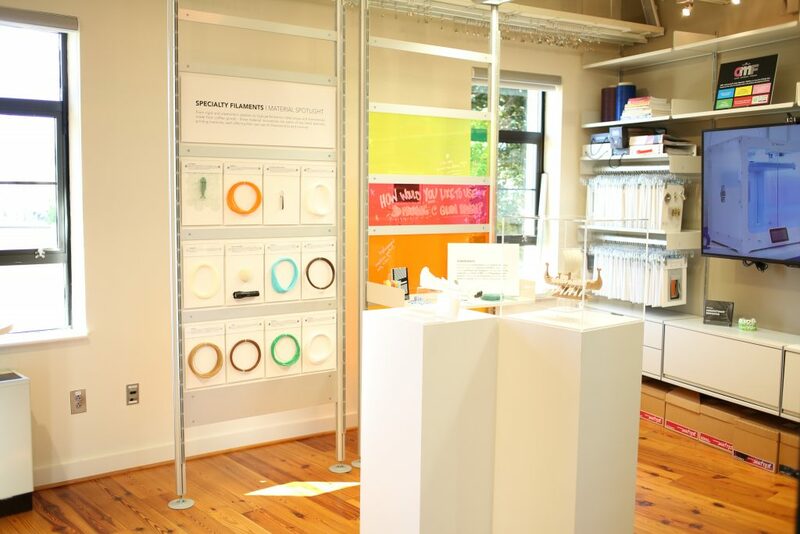 The Concept Gallery is a specialized working space with the mission to advance and foster collaborative innovation with customers, trade partners and associates. Through the resources and programs of the Gallery, our goals are best summed up in three words: Discovery, Inspiration and Creativity. Featuring more than 200 different products, the Glen Raven Materials Library serves as a resource for materials driven design. The Materials Explorer can be accessed online and is the only free, searchable materials database located in the USA. Inspiration for new ideas can come from anyone and anywhere. With a focus on innovation, the Concept Gallery curates exhibits that engage visitors in an experience intended to invite discovery and inspire new ideas.